For decades, fighting nuclear weapons has been the cornerstone of the work of SF Bay Area PSR. Our long-standing motto still stands, that prevention is the only cure. We stand for the complete abolition of nuclear arms, and the redirection of funds to support human needs, not weapons of death. Our commitment to this has never wavered – it didn’t during the Cold War, it didn’t as nuclear weapons spread to more countries, and, as we enter an ever more terrifying time, it won’t now. As Trump takes office, we, in the shadow of the Lawrence Livermore Nuclear Lab (LLNL), are at the crossroads of our country’s nuclear arms program. Last year, $165 million was spent on updating nuclear arms at LLNL, part of the unfortunate Obama Administration legacy nuclear weapons modernization program projected to cost an astounding $1 trillion over the next 30 years. Mindful of our challenges, we are continuing our work at the United Nations, which has taken up the task of negotiating a treaty among members to ban nuclear weapons. This is a positive step forward and speaks to the overwhelming international will to rid our planet of the very weapons that could destroy it. While this effort was undermined by the Obama administration, and will certainly face opposition by Trump, we will be gearing up to strongly work to guarantee that significant progress may be made in the global arena in 2017. However, the era of Trump ushers in a deeply worrying time for all of us concerned about planetary health and survival. A demonstrably ignorant and erratic leader who tweets kneejerk, ill-informed statements about nuclear arms (and much else), President Trump will now have ultimate power over 5,000 nuclear weapons, 1,000 of which can be launched within mere minutes. The detonation of a small percentage of our weapons could cause irreparable damage to our planet evinced by nuclear winter, whereby soot and detritus from incinerated cities would block enough sunlight to cause global famine that could cause up to 2 billion deaths. Reflecting our rising dangers, within the first few days of Trump’s ascendancy to power, the Bulletin of Atomic Scientists’ Doomsday Clock was reset 30 seconds closer to its “Midnight” that signifies the demise of human existence. Please see our action below geared to help prevent President Trump from impulsively launching a nuclear strike that would end it all! We all have a major part to play in forging a strong movement to resist the stunning array of “clear and present dangers” posed by our new Administration. In the coming months, we will keep you and all of our supporters connected to vital information geared to effective action on all fronts – and your support will ensure that we can continue to do so – for which we deeply thank you! Keep Trump's Finger off the Nuclear Button! Current law gives the President authority to launch nuclear weapons within seconds, without any checks and balances or consultation with other officials. For obvious reasons this power became even more terrifying on January 20th, but now, there’s something you can do about it. Congressman Ted Lieu (CA) and Senator Edward Markey (MA) has introduced S. 200, the Restricting First Use of Nuclear Weapons Act, which would prohibit the President from launching a nuclear first strike without a declaration of war by Congress. Please go here to ask your senator to co-sponsor this bill! In 2016, we are honored to have received support from so very many of you. A list can be found here! Supporters like you will ensure that we can be as strong as possible to face unprecedented threats to our planet, our democratic society and our future. You are helping us ensure that California will continue to be the standard-bearer for environmental and social justice legislation, including protective regulations, common sense gun control and equity-based environmental justice policies. We will also join with national allies to resist Trump’s anti-environment, anti-peace agenda, the rise of the white supremacist alt-right movement, and new attempts to rekindle a disastrous nuclear arms race. We hope to grow to face our unprecedented challenges. If you have family, friends or colleagues who are interested in our work, please let us know, and we’ll be in touch right away! SF Bay Area PSR Marches! 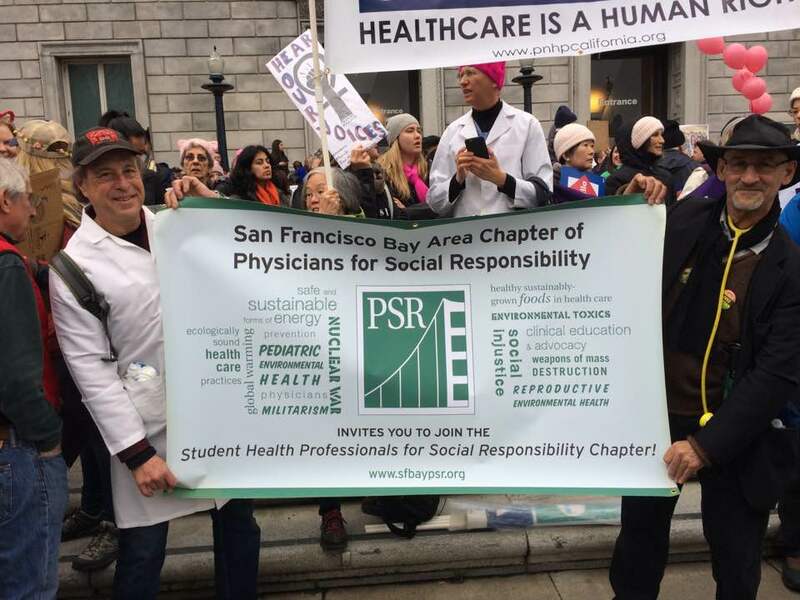 In both San Francisco and Oakland, SF Bay Area PSR members joined over 150,000 people at the Women’s March to fight for justice, civil liberties and human rights for all including the right to accessible and comprehensive reproductive health services. We brought to the marches an emphasis on defending health, environmental justice and an end to nuclear arms. These marches joined in solidarity with marches in every state, in dozens of countries around the world, from small towns to huge cities, to show our commitment to fighting the immense dangers to all of us posed by the incoming Trump Administration. Estimates suggested that the combined marches represented the largest mass demonstration in history, with over 3 million marching in the United States alone. Through our collective demonstrations, we found hope and reinvigorated allies for the future. We’re also so heartened to see planned and continuing actions following many of the rapidly-announced and very dangerous plans emanating from the Trump Administration, including the continuation of the Keystone and Dakota Access pipelines, new horrific, xenophobic measures restricting immigration, attacks on reproductive health services and information, and more. Our resolve will remain strong, thanks to the support of people like you! The January issue of the University of California at San Francisco’s publication, Living Green, featured the work of SF Bay Area PSR leaders Dr. Bob Gould and Dr. Tom Newman among other dedicated faculty members. 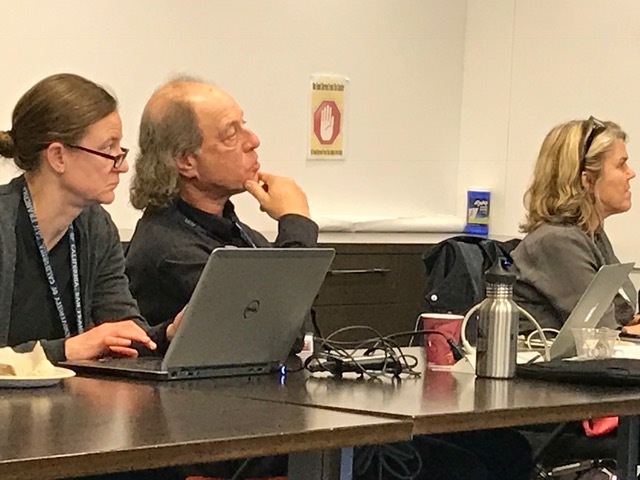 Tom and Bob joined 19 other climate sustainability leaders at UCSF’s second annual Carbon Neutrality Initiative (CNI) Workshop, speaking about their efforts to educate and advocate for a more sustainable, equitable world. Dr. Gould spoke about an accredited elective course he organized with medical student Hannah Archibald, “Women’s Health, the Environment, and Health Professional Activism.” Within the course, students learn about a variety of environmental impacts on reproductive and developmental health, and included discussion of the positive impact of healthy food systems, as well as the ecology of breast cancer. The course, with updated content, will continue in 2017. Dr. Newman talked of the Climate Change Inquiry Course he developed in collaboration with his colleagues. In the course, he examines the interaction between human health and climate change, including environmental justice, carbon footprints, and effect of diet on climate change and health. To read the full article, which includes the efforts of other UCSF leaders to address and confront climate change, go here! Copyright © 2017 SF Bay Area PSR, All rights reserved.